We first visited Plovdiv in 2016 and were immediately taken by Bulgaria’s second-largest city. As one of the oldest cities in all of Europe (some say the oldest continuously-inhabited city on the continent), Plovdiv is packed full of ancient history, a charming old town, and a thriving arts district with new things popping up all the time. 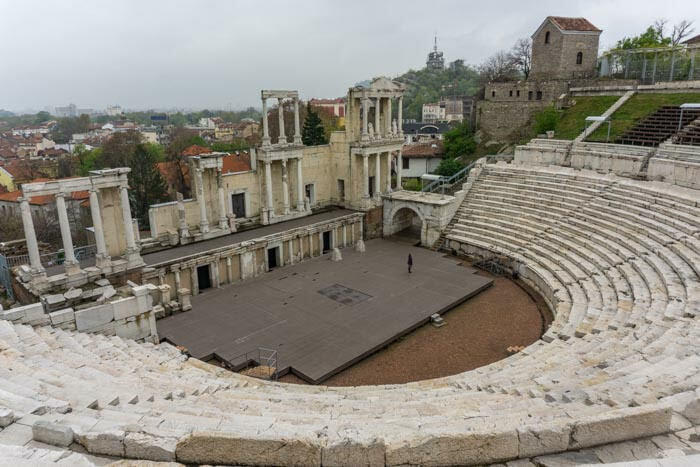 Picked as one of the European Capitals of Culture in 2019 (the other one is Matera in Italy), Plovdiv has seen a lot of investment into its infrastructure in the three years since we last visited. The streets are cleaner and in better repair, the restaurant scene is thriving, and it is generally more “tourist-friendly” that it has been in the past. While we always thought that Plovdiv had a lot to offer foreign visitors, it is often overlooked. However, now is the time to visit Plovdiv and to see everything that this enchanting Bulgarian city has to offer. If you’re looking for an incredible stop on your Bulgaria itinerary, then make sure to set aside a couple of days to enjoy the ancient charms of Plovidiv. Much of what Plovdiv has to offer by means of tourist attractions happen to be outside, including the ancient stadium and amphitheatre, the Kapana neighbourhood, Nebet Tepe, and the enchanting Old Town. Therefore, it might not be best to visit Plovdiv in the winter unless you have a high tolerance for the cold or a very warm winter coat. Plovdiv has a continental climate and very much experiences all four seasons with a vengeance, including snowy, cold winters and hot, muggy summers. Average winter temperatures hover around around freezing and can often reach several degrees below. Contrary to that, in the peak of summer, expect the highs to soar to well over 30°C (86°F). The shoulder seasons between March-May and September-November can be some of the most pleasant to visit Plovdiv with mild temperatures and fewer tourist crowds, though Plovdiv doesn’t get overcrowded whatever the season. Though spring time can be rainy at times, you are also just as likely to be blessed with sunny skies and temperatures in the mid 20s C (70s F). September brings a wine harvest and is one of the best times to go wine tasting in nearby Brestovitsa in the Thracian Valley, with high temperatures still clinging to the summer warmth. Later in the autumn brings a bit of chill, however, it is a fantastic place to visit for beautiful colours. Not matter what season you choose to visit Plovdiv, you are sure to be charmed by the lovely city. As the second largest city in Bulgaria, Plovdiv is quite well-connected to other Bulgarian cities and also a few international cities. If you’re visiting Plovdiv from Sofia, there are frequent buses from Sofia’s central station which leave roughly every 30 minutes-1 hour throughout the day and the journey takes about 2.5 hours. There are two companies that offer service to Plovdiv — Karats and Herbos — and you need to purchase them from their respective ticket counters at the bus station. Because there are so many connections throughout the day, there is really no need to purchase tickets in advance, generally you can just get a ticket for whichever bus you want about 30 minutes before it is due to depart. This may be slightly more difficult during the more busy summer season, however. Karats buses leave Sofia in the morning and cost 9.50 BGN (€4.75) per person and Herbos, which costs 14 BGN (€7) per person, leaves in the afternoon. There is a train service between Sofia and Plovdiv, however, unless you have a general curiosity of or affinity for communist-era trains, it is recommended you opt for the bus if you’re relying on public transport. The trains in Bulgaria haven’t really been updated since the 1960s and they are painfully slow and can be blisteringly hot in the warmer months. It also doesn’t run nearly as frequently as the bus. Plovdiv also has a small international airport that serves Ryanair flights from London Stansted on Mondays, Wednesdays, and Fridays. There does not appear to be a public bus from Plovdiv Airport to the city centre, however, it is only located about 12 km away so a taxi is unlikely to cost more than around 10 BGN (€5). Once you’re in Plovdiv, you will find that the majority of the city’s top attractions are within easy walking distance and it is rare that you will need to take any sory of public transit while in the city itself. However, Plovdiv is served by a bus and tram network that is affordable and easy enough to navigate should you need to. It is also possible that you might need to take a taxi, as the main bus station is located about 3 kilometres outside of the Old Town and city centre. If you want to take a taxi, do keep in mind that scams can be common and to avoid being ripped off, try not to hail just any cab right off the street and do not jump in a car from those lingering in the bus station advertising a taxi. Instead, look for taxis with the numbers either 6155 or 6665 as they are reputable, however, it is also good practice to ensure that the meter is running. You can also call a taxi on the app for taxi company 6155 (eko taxi) to ensure that you get a safe ride. Expect a ride from the bus station to the city centre or Old Town to cost no more than around 4 BGN (€2), it will often be less. Plovdiv is arguable one of the most tourist-friendly cities in Bulgaria and has a lot to offer visitors. While there are many tourists who treat Plovdiv as a hectic day trip from Sofia, the city is best experienced over a span of at least two days. If you’re wondering what to do in Plovdiv in 2 days, take a look at this detailed Plovdiv itinerary. This is the most efficient way to get the best feel for this ancient city in a short period of time. If you’re wondering what to do in Plovdiv during your first day in the city, then your best best is going to be exploring the main sites within the Old Town. If you are only able to do a Plovdiv day trip, this is the itinerary that you should follow, as well, as it will take you by the historical highlights of this incredible city. If you’re interested in visiting Plovdiv, then it is likely that you are already familiar with its incredibly preserved ancient amphitheatre. The Ancient Theatre of Philippopolis is the most iconic monument in Plovdiv and it is one of the best-preserved amphitheatres of its kind. Although today this is Plovdiv’s main tourist draw, the amphitheatre wasn’t actually discovered until the early 1980s as there have been buildings stacked on top of it for thousands of years. Though a good portion of it is still in its original form, a lot of the theatre has also been reconstructed by archaeologists to make it look similar to what it would have looked at during ancient times. Today, the Ancient Theatre of Philippopolis is not only an excellent tourist attraction, but it also hosts cultural theatrical events throughout the summer season, so if you happen to be visiting when there is a performance, try to see one. The acoustics in the ruin are meant to be fantastic. Entrance to the theatre costs 5 BGN (€2.50) per person and it allows you full access to the structure. If you make this your first stop of the day, it is also likely that you could have it almost all to yourself, which is truly a surreal experience. After visiting the Ancient Theatre, it is time to hike up another of Plovdiv’s famous hills (the city, like so many others, was built upon seven hills): Nebet Tepe. Nebet Tepe is the highest hill in Plovdiv’s Old Town and was once home to it’s fortress. Though only ruins of the structure remain today, it provides stunning views of all of Plovdiv below where you can truly see both the confluence of old and new in the city and why it was a strategic place to put a fortress. Though it is a great stop in the day time when touring the Old Town, it is also a great place to chill out on a pleasant evening. It is popular among locals in Plovdiv to find a place on one of the fortress walls and enjoy a few snacks and beers while watching the sun sink below the city. Just please remember to be sure to clean up after yourself and that it isn’t technically legal to drink alcohol in public in Plovdiv, however, this law will rarely be enforced. If your are wondering what to do in Plovdiv and are interested in its through the centuries, then a visit to the Regional Ethnographic Museum is an excellent thing to add to your itinerary. Located in a beautiful historic house that used to belong to a wealthy merchant in Plovdiv, this is the second-largest museum of its kind in Bulgaria. The permanent exhibition includes artefacts from the ancient city of Plovdiv when it was inhabited by the Thracians, to medieval artefacts, to some more modern antiquities. This is an excellent stop to really get a grasp of what life has been like in Plovdiv throughout its over 6,000 years of history. Entry is 6 BGN (€3) for adults and 2 BGN (€1) for students with a valid ID. If you enjoyed the Ethnographic Museum, it is likely that you will also be interested in one of the many other house museums in Plovdiv’s Old Town. There are numerous houses that you can visit where you can see how wealthy merchants lived in Plovdiv in centuries passed. Some of the museum include the Balabanov House, the Kilanti House, and the Hindliyan House. All of these museums are located within the Old Town in the classic Bulgarian Revival houses that can be found throughout the country. After spending a significant amount of time within the Old Town of Plovdiv, it is time to head down the hill and to visit the more modern business centre of the city. While this area might seem as if it doesn’t have the old charms of the Old Town, you must realise that you are walking on over 6,000 years of human history disguised as modern streets. One of the best places to see that is in the Ancient Stadium of Philippopilis. Another ancient structure, the stadium was not discovered until 1969 and there are parts of it that you can see along Plovdiv’s main pedestrian street. There is a bit of the end seating area that you can climb down and visit yourself, but the majority of the stadium is covered by the street that sits atop it. However, you do have the opportunity to see more of the stadium at possibly the most interesting H&M in the world. Because in the basement of the multinational fast fashion shop lies even more relics of the ancient stadium, so you can get a healthy dose of history while browsing for the latest trends. There is also a 3D film where you can learn about the history of the stadium. The film runs every 40 minutes between 10-17:00 daily and costs 7.20 BGN (€3.60) per person. After you’ve had your fill of ancient historical sites, take the time to browse the shops or people watch along Knyaz Alexander I, Plovdiv’s main pedestrian thoroughfare. Here you can shop in some popular multinational chains or take in the Plovdiv “Together” monument celebrating the city’s bid for 2019 European Capital of Culture. There are a few restaurants and cafes along the pedestrian street, as well, however, we would recommend going for a bite to eat in the nearby Kapana neighbourhood, which is only about 2 minutes walking from Knyaz Alexander I. If you want an easy way to see all of these sites while also getting some great historic context from a local, we recommend taking a free walking tour with Free Plovdiv Tours. In the months of May-September, the tour runs at 11AM and 6PM daily and in October-April, it runs at 2PM daily. The tour itself is free, however, the guides do only work for tips so it is good practice to tip your guide what you believe the tour was worth. Keep in mind that the tour does not take you into any of these monuments, only outside of them to give you an overview, but it does give you an excellent introduction to the history and culture of Plovdiv. If you’ve got a weekend or just another day to spend in Bulgaria’s second-largest city, here is what to do in Plovdiv on the second day! After spending your first day in Plovdiv exploring all of the ancient historic sites of the Old Town, its time to spend your second day exploring the trendy streets of Plovdiv’s trendy Kapana neighboourhood. Located, at most, a 10 minute walk downhill from the Old Town, Kapana can feel like a different world from the ancient sites of the historical centre. This quarter, which translates to “The Trap” in Bulgarian, has been completely refurbished in the past few years and even has seen a significant transformation from when we were there 3 years ago. As the traditional arts and crafts quarter of the city, Kapana was once home to over 900 privately-owned shops that were left abandoned after the communist regime shut down private industry in Bulgaria. In the years after the fall of communism, the shops remained abandonded due to the fledgling capitalistic economy in the country. Only a few years ago, Kapana was barely more than a car park. This all changed as the government won the bid for European capital of culture and was able to pour a massive investment into the formerly decrepit quarter. Businesses were encouraged to open and artists were commissioned to make the streets and walls as colourful as possible. Today, Kapana is home to a maze of streets offering trendy eateries, chilled out coffee shops, independent retailers, and a number of hip bars making it the top choice for nightlife and dining in the city. There is also a lot of street art to check out in the quarter, as the city commissions artists twice per year to paint murals on the walls of Kapana. If you want to learn more about the neighbourhood and happen to be visiting Plovdiv on a Saturday or Sunday, then consider taking the Kapana Arts & Crafts District Tour, run by the same people who give the Free Plovdiv Tour. It runs every weekend at 11AM May-September and 4PM October-April and costs 18 BGN (€9) per person. After exploring the Kapana district and seeing some of the professionally commissioned street art in the city, you can see some more of the art scene in Plovdiv by walking only a short distance from the Trap neighbourhood. If you climb up the stairs from the “Together” monument just off the pedestrian street, you will find a few walls decorated with some beautiful murals (and a bit of grafitti). Though most of the art is done by beginning street artists, you might notice some pieces done by more recognisable names like Stern, Nasimo, and Bozko. Though Plovdiv is known to be a traditional and historic city, this does not mean it doesn’t foster incredible free expression from a creative young population. If you’re visiting Plovdiv for more than one day, you would be missing out if you didn’t venture out into the Thracian Valley and sample some of the best wines to come out of Eastern Europe. Though not traditionally what comes to mind when it comes to viticulture, Bulgaria produces some excellent wines and has one of the oldest wine-making traditions in the world. And the biggest production area of the country happens to be just a few kilometres outside of Plovdiv. If you’re interested in wine tasting, head to the town of Brestovitsa, which is located about 20 kilometres outside of Plovdiv’s city centre. This small town is home to seven independent wineries that produce some unique and delicious vintages. We visited the small, family-run Villa Vinifera and were able to sample 4 of their great wines and 2 rakijas while snacking on some cheese and learning about the wine culture of Bulgaria and of the vineyard in particular. Each vineyard offers something different when it comes to tastings, but it is entirely possible to visit the area independently, without going on an organised wine tour. A taxi to the town of Brestovitsa from central Plovdiv will cost roughly 15 BGN (€7.50) one way. You can, also book an organised wine tour if you don’t want to be at the mercy of fickle cab drivers. Pavaj — This is one of the most loved restaurants in the Kapana neighbourhood, and it isn’t hard to see why. This trendy eatery serves traditional Bulgarian fare with a modern twist. They have a number of specialities, great salads and are also incredibly vegetarian-friendly. It does get busy at peak hours so it can be in your best interest to book a table in advance. Tam’s House — Another fantastic Kapana eatery, Tam’s House is a bit more upmarket but still retains affordable prices. They serve fantastic modern European cuisine, have a great wine list, and also have some unique desserts. Veggic — Located next to Pavaj, Veggic is an excellent option in Kapana. They have an extensive menu serving only vegan food, however, it has none of the fake meat that plagues the menus of so many vegan restaurants. It also has an unpretentious air and is welcoming to even the most carnivorous of patrons. Skaptobara 2 — There are a few burger joints in Plovdiv, but the one we would recommend is Skaptobara 2. This burger restaurant also has a couple of locations in Sofia and they have a range of burgers available, including a vegetarian quinoa burger. They also have an extensive craft beer menu with many locally brewed beers on it. Soup Pause — Bulgarians love their soup and most cities are blessed with a number of soup bars where you can get a refreshing bowl of tarator or a steaming bowl of lentil soup. One of the best places for this in Plovdiv is Soup Pause, where they have a number of incredibly affordable soups available daily and some other hot food as well. It is a great option for a quick, hearty, and budget-friendly lunch that is very popular with locals. Cat & Mouse — Plovdiv, and Bulgaria in general, has a burgeoning craft beer scene and one of the best places to try some of the best craft beers from Bulgaria and beyond is at Cat & Mouse. This trendy bar has a myriad of craft beers available and also an extensive wine list as well. It is the perfect place to kick back at the end of a long day of sightseeing. Dukiana — If you’re into coffee, then you need to make sure to make a stop at Dukiana. This coffee shop claims to the best in Plovdiv, and they do make a mean cup of coffee. They also roast their own beans that are sourced from all over the world. Bakeland — If you’re looking for a cake, pastry, or a coffee, then heading to Bakeland is an excellent choice. This bakery is newly opened and they serve a range of freshly baked cakes and pastries along with some great espresso drinks. This is a great place to pop into to indulge a sweet tooth. Airbnb — If you’re not after a traditional hotel or hostel, then Airbnb can be a good option in Plovdiv. There are a number of properties available on the platform ranging from private rooms to full apartments. If you’re new to Airbnb, you can click here to get up to $40 off your first stay with Airbnb! Not quite what you’re looking for? Click here to browse more Plovdiv hotels! Plovdiv is often tourists favourite city to visit in Bulgaria and it is not hard to figure out why. Packed with a vast and extensive history and filled with interesting things to do, Plovdiv is a destination not to miss on any trip to Bulgaria. Are you wondering what to do in Plovdiv? Have you been? Let us know in the comments!